But this is a bit strange. There are certainly challenges to prosperity looming, such as China’s downturn, the collapse in commodity prices, continuing and rising national deficits, and others. And of course, this is aggravated by the uncertainties generated by an election season of unprecedented unpredictability. But a calm look at all of these issues shows that this is a minor storm which our ship of state should weather easily. This is reflected in the stock market, which is a fair indicator of the main street economy if you take the long view as shown here. 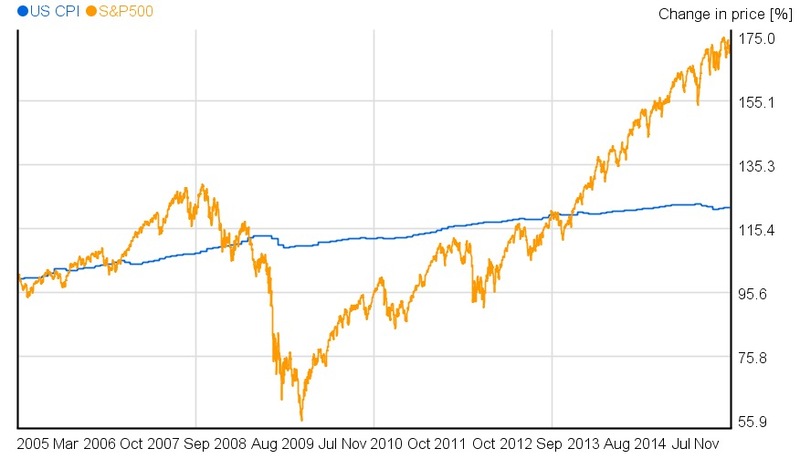 The S&P 500 index is the most representative view of the U.S. stock market. It fluctuates of course, but the secular trend is obvious. Furthermore, the correlation with the Great Recession is clear, confirming the relation to the economy. If you extrapolate the line before the recession you can see that the index is already approaching where it would have been if no recession had occurred. In other words, the systematic upward trend remains intact. Our economy is prospering. This doesn’t mean that there has been no lingering impact of the recession. The figure also graphs the consumer price index over the same period. This is quite stable, and indeed somewhat lower than the Fed would prefer. Note that there has been a substantial period during which the S&P 500 under-performs the CPI. Throughout that time, not only did households lose wealth but their incomes declined in real terms. It is not surprising that people are a bit grumpy. They see a glass half-empty. However, different segments of the electorate see matters quite differently. Younger voters seem hell-bent on revolution, as the crowds attending Bernie Sander’s events clearly show. Older voters are far less dissatisfied. This reflects a subtle change in the U.S. economy that has great portent. In the past, older segments of our population were the poorest. The young were more prosperous and saw better future prospects. Unexpectedly, this has been entirely reversed. Look at this graph. Over the 30 years from 1983 to 2013, life has gotten much worse for those under 50 and much better for those older. Understandably, this is reflected by their choices in the current election. Economists at the Federal Reserve are constantly investigating diverse aspects of our economy. One of their recent results reveals interesting aspects of the impact of education on wealth disparity. 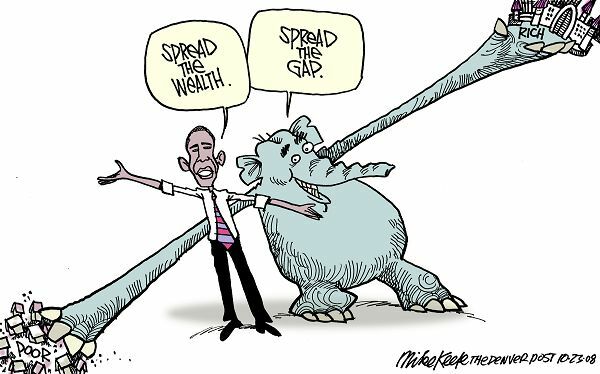 Much is currently being made of the increasing inequality in wealth between the top and bottom segments of our population. In fact this is the defining issue on the Democratic side of our presidential contest. But remedies, assuming they are appropriate, need to be based on facts rather than ideology or surmise. Look at this comparison of how education affects the accumulation of wealth by different segments of our population. But keep in mind that for Asians and Hispanics, these data don’t discriminate between recent immigrants and those whose family heritage is now mostly native American. The broad picture is unsurprising, but if you look below the surface it tells us quite a lot. The quality and availability of education varies significantly between the affluent and the poor. Whites and Asians preponderate in the former, while Hispanics and Blacks constitute most of the latter. But even when higher education is achieved, the poor don’t appear to benefit as much as the affluent. Education helps but it isn’t a cure-all. In fact, for Blacks in particular, it has at best marginal impacts. On average, Blacks with a college degree have lesser prospects than Whites with only a high school education. While not ignoring this useful aspect of life, we must look elsewhere to achieve major changes. Notice the small dispersion of the results for Whites, as represented by the narrow confidence bands. For them, the level of education is almost a perfect indicator of their prospects for prosperity. This explains why intellectual leaders, almost wholly White, grasp for this method of equalizing wealth for everyone. The results for Asians vary widely at any level of educational attainment. I think this derives from the diversity of our Asian-American population. Quite likely, those of Chinese and Japanese ancestry fare better than some from other East Asian regions because of differences in family resources. The odd reduction in prospects for those who only attain an Associate degree is a bit of a puzzle, although I could hypothesize an explanation based on resource limitations preventing further education and variations in innate individual capabilities. Once the kick-start of education is passed, differences in life and work experience continue to affect wealth prospects. Getting off to a good start is important, but as with education apparently other factors are crucial. 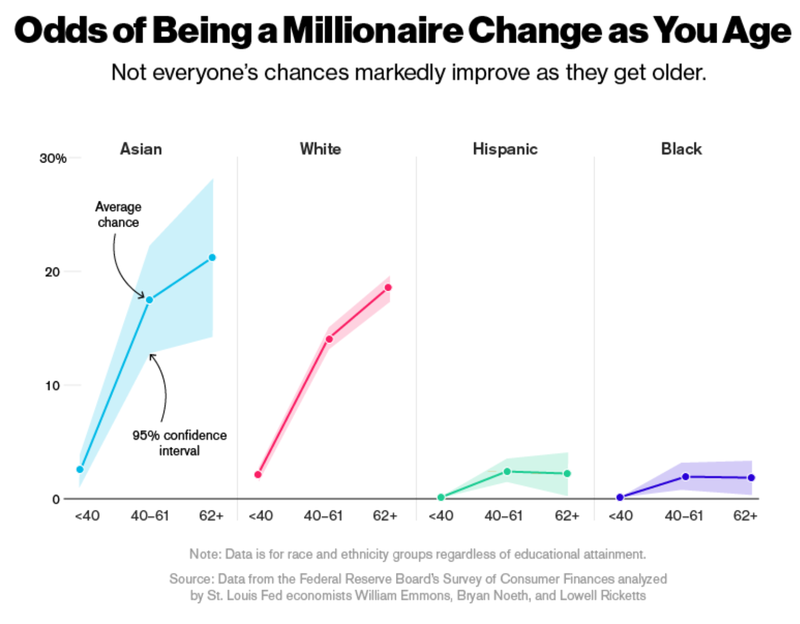 Look at this examination of the effects of age and experience on attaining the same marker for prosperity. Once again, Whites and Asians are better situated to exploit their initial advantages. 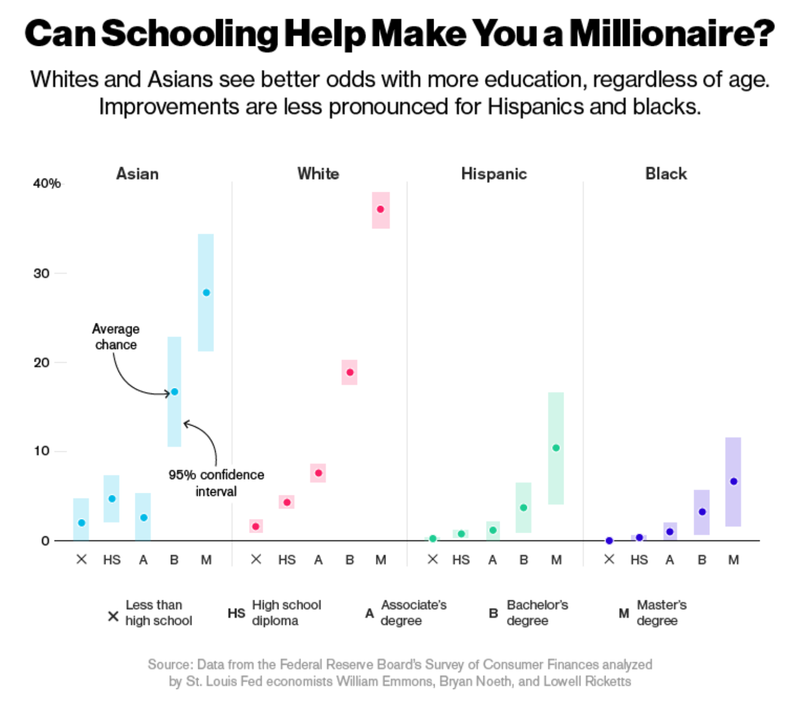 For many Asian-Americans this effect is even more significant. 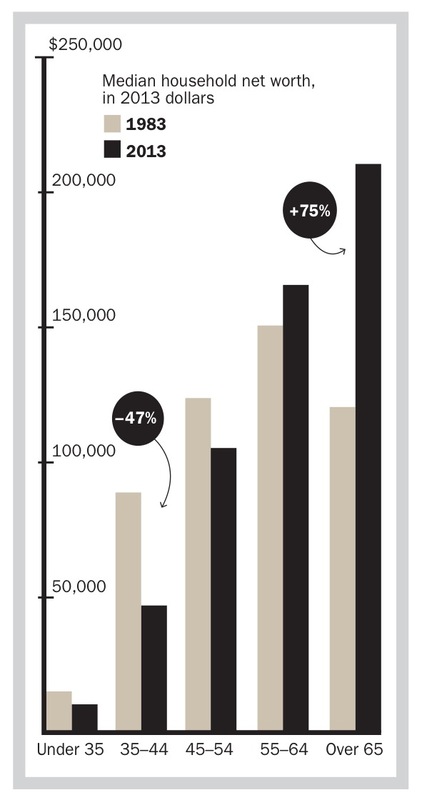 But for Hispanics and Blacks, their prospects not only don’t increase but appear to erode as they grow older. Those advantages some initially derived from higher education disappear as opportunities are blocked and/or hopes wane. Of course, another factor is that improvements in the prospects for the poor in recent decades haven’t helped our current older population. Thus, perhaps this disappointing trend will diminish in the future.